I’m getting really excited and am nervous at the same time. It’s six days until my short story Town Curse is published. I’ve had an awesome time working with the other authors and editors. There are stories that will appeal to all types of readers. Enjoy a multiple genre anthology written by talented authors across the world. Dark Fantasy, Historical, Historical Fantasy, Science Fiction, High Fantasy, Literary Fiction, And more! 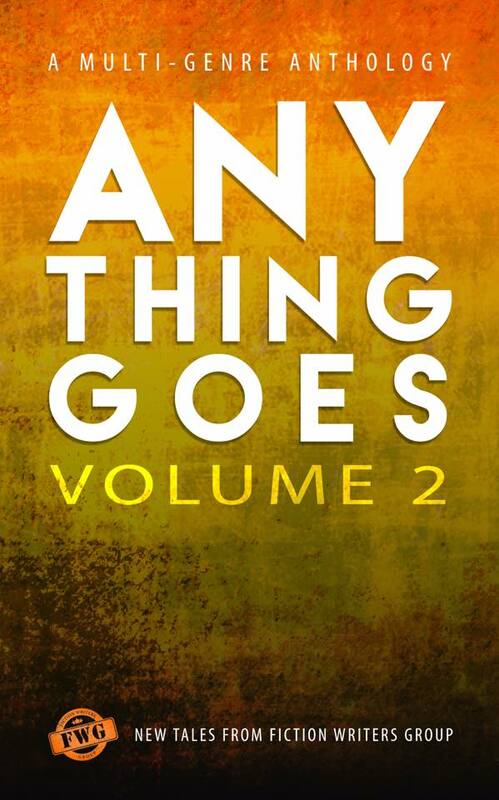 Anything Goes, Volume Two is suitable for YA and Adult audiences. Here is the list of the cool authors that are included in the Anthology. ** Stella – by Marta Karnes – When Tommy Cole attempts to fulfill a dream nearly lost, a tragedy unfolds. He tries to rebuild his life, but in the end will he lose all that he loves? ** Tempest – by Rae Z. Ryans – In 1046, William de Hauteville died, but death is only his beginning. As he stumbles through the netherworld, a new face rises from the sands and unleashes his reverent bones. ** The Familiar – by S. E. Hudnall – They say a wizard must choose – love or magic. They also say the greatest creature of legend no longer exists. Both sayings are of long antiquity- both are wrong. ** Becoming Nonna – by S.E. Hundall – Sometimes, it takes a tragedy to open your heart. ** Disaffection – by Joseph Y. Roberts – What kind of man is born of a childhood with a father whose love is indistinguishable from hate? ** The Last Walkabout – by Joseph Y. Roberts – Old, lame, and half-blind, Targ is cast out of the tribe to find his way into the Underworld alone. ** Stasis by Jeroen van Baardwijk – Life can be scary. Especially when you wake up one day and have no idea where you are. ** The Bond – by Jeanne Felfe – Maggie and the people on the Gulf in Port Aransas are tough, but when a hurricane takes direct aim, can her family’s bond survive? ** The Price of News – Jeanne Felfe – What price will one man pay for news? ** Book Hunter – by Damien Lutz – When anti-tech activists cripple the city’s power, cyborg Zack Vella is forced to hunt down the only remaining source of information – rare printed books. But will Zack find the information he needs before his own power runs out? ** Sea of Ingenuity – by Damien Lutz – When a lunar eclipse occurs on second earth, humanity realizes their greatest achievement comes at a price. ** The Unrendering – by Paul Draper – A tour bus carries a university party to a food processing plant in the mountains high above Geneva. The personal networked interface seems a bit patchy for one student. ** The Wrong Harvest – by Paul Draper – An English farm in summer, a boy who can talk with nature, and a father with a secret. What hides beneath the soil? ** Home for the Holidays – by Kerry E.B. Black – Twin sisters risk a winter storm to celebrate the holidays at home, but a brush with the supernatural may alter their plans. ** Wave Dancer – by Michali Lerner – Some people hear the call of the sea. Will one lonely young girl listen? ** When It Rains – by Danise Janica C. Bautista – “The rain will remind me of you…” -Lawrence. Can a voiceless love end up with a happy ending? Or will the silence cut it off the forever? ** Town Curse – by Diane Riggins – It’s up to one person to break the town curse before anyone else disappears. ** Silver – by Dani Duck – Thanks to her teammates, superheroine Silver is fighting for her life as well as her sanity. ** The Guardians: When the War was Over – by R.L. Andrew – Archangel Gabriel is facing the most difficult situation since existence began. The future of mankind hangs in the balance as Gabriel battles with a former friend in a war he isn’t sure is worth it. ** Teacups and Tansy by R.L. Andrew – Murder and mayhem ensues when Sabrine takes her first detective case. What she doesn’t expect is the geriatric Jerry Springer Show. ** The Ride – by C.J. Galaway – Get to know the cop behind the lieutenant’s bars and take a sneak peek into his interesting past. ** In Shadows – by M.N.Morrow – Colette is tormented by a shadow and her mother’s lifestyle, she seeks help from a stranger who regrets her choices. ** The Harbor – by Elizabeth Ann Patterson – When love isn’t enough, how do you find the words? Wonderful, so excited for you Diane!